CHRISTIANSTED, USVI: Cane Bay Cares, a service initiative of Cane Bay Partners LLLP, donated $45,800 to the St. Croix Long-Term Recovery Group (STX LTRG), a project of St. Croix Foundation and coalition of non-profit relief organizations, to fund the repair of roofs and the retrofitting of volunteer housing on St. Croix. The funds were allocated from the disaster relief fund established between Cane Bay Cares and the Community Foundation of the Virgin Islands. About $30,000 of the donation will be used to repair or replace 2-4 roofs for St. Croix residents in need, while $10,000 will be used to complete the retrofitting of volunteer housing at the former St. Dunstan’s School campus, and the remainder will be used toward the highest priority items. “Like so many of the other hurricane relief efforts, we’ve spent this last year building out our long-term work, which for us is focused on educational programs. But we’ve remained active with the coalition of relief organizations, the LTRG, so when we heard about this need, we wanted to help keep the momentum going and make more people whole,” said David Johnson, co-founder of Cane Bay Partners, the company funding the Cane Bay Cares effort. 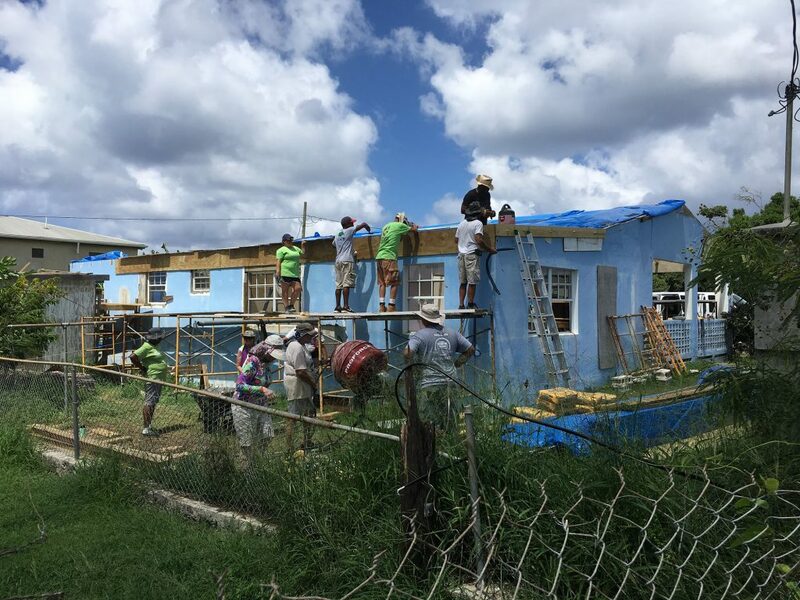 The effort to repair or replace roofs damaged in Hurricanes Maria and Irma was spearheaded by the LTRG and its member organization Lutheran Social Services. Since the storms hit, they have been working to assist individuals and families who were not covered by FEMA or exhausted all of the assistance that FEMA provided. In order to reach those in need, the LTRG coordinated a massive volunteer effort through their member organizations’ networks. 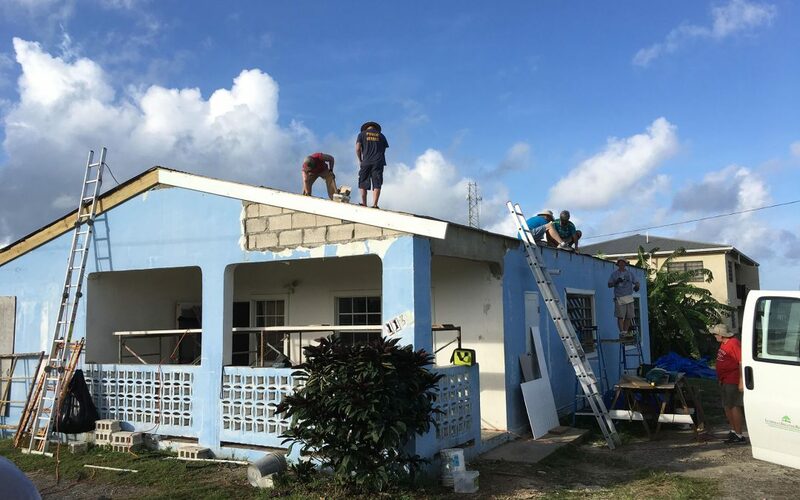 So far, the roof repair program has replaced 23 roofs on St. Croix but efforts have been delayed due to lack of housing for volunteer construction workers. The completion of work at St. Dunstan’s will facilitate more volunteer crews to assist in repairing or replacing roofs. Volunteer crews with the St. Croix Long Term Recovery Group and Lutheran Social Services replace roofs on St. Croix. Cane Bay Cares delivered more than 75,000 pounds of aid in the aftermath of Hurricanes Irma and Maria, including 50,000 bottles of water, 4,000 freezer packs for medical use, 44 generators, 800 solar lights, 317 holiday gifts, as well as food, tools, tarps and more. The organization, now as a project of St. Croix Foundation, has committed about $60,000 annual funding from Cane Bay Partners to fund its flagship program, Operation Inspire, a project-based learning after school program. Cane Bay Cares also has supported the World Ocean School, KidsCount VI, Project Promise and St. Croix’s three junior high schools as part of its long-term efforts to support the island. About the LTRG: The St. Croix long term recovery group (LTRG) is a cooperative body that is made up of representatives from faith-based, non-profit, government, business and other organizations working within St. Croix to assist individuals and families as they recover from Hurricane Maria. The goal of the LTRG is to unite recovery resources with community needs in order to ensure that even the most vulnerable in the community recover from the disaster. About Cane Bay Cares: Cane Bay Cares is a service initiative of St. Croix-based Cane Bay Partners VI, LLLP and a project of local 501c3 St. Croix Foundation. Its long-term mission is to raise awareness and support for critical issues facing the island of St. Croix in the United States Virgin Islands. It was established in response to the devastating impact two category five hurricanes had on the USVI with targeted relief efforts on St. Croix. The organization is committed to addressing both short and long-term issues facing the island and its residents. All donations to Cane Bay Cares are through STXF and are 100% tax deductible.